As part of the Ferndown Fete on the Field celebrations, Ferndown Rotary Club and the organising committee have added the John Thornton Pram Race, which will take place on the King George V Playing Fields on the same day as the fete, on Saturday 24 June. The Pram Race is back bigger and better than ever. 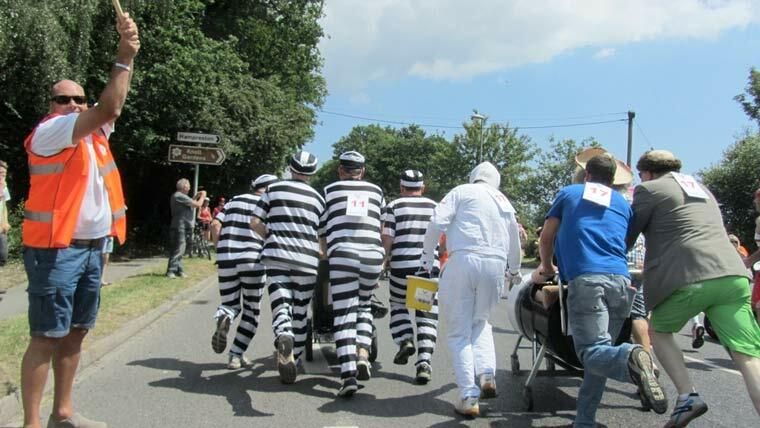 This year is the first time it will be known as the John Thornton Pram Race. if you don’t want to miss out on this fun packed event get a team of five together, with four pushers and a baby and obviously you’ll need a pram too. Dressing up essential! The route is around the full King George V Playing Fields with a number of physical and mental challenges on the way. If you feel like you are up for the challenge and maybe have the stamina, brains and passion to win, then contact the organisers for an entry form and enter your team. Please contact pramrace@ferndownfotf.org to register your interest or call Pete on 07792 121 645 for more details. Visit the Ferndown Fete on the Field website at https://www.ferndownfotf.org/ find out all about this great event and all the other activities that make it a Fern-tastic day out for the whole family.